It was an 80s phenomenon. The media loved it. The tabloids couldn’t get enough. 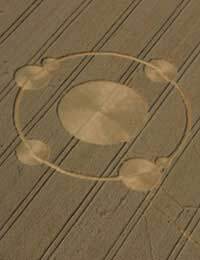 Crop Circles – strange circular depressions left in fields of crops by unknown means. Speculation raged. Could it have been aliens landing in their flying saucers, leaving an imprint on the ground? Could it have been some weird weather phenomenon? Mystic mind energies perhaps? In 1991, the truth emerged. It was none of these things. In fact it was nothing more than two old geezers having a laugh. Doug Bower had visited Australia where he had seen media reports of the Tully UFO incident, in which a circular imprint had been left in the reedy swampland from which a flying saucer had been seen taking off. In 1978, when he was back in England, Doug was down the pub one night with his mate Dave Chorley. As they were walking home together, Doug told Dave about what he had heard. They agreed it would be a bit of a laugh if they a created a flying saucer-like indentation in the crop fields to see what kind of reaction they could get. So they did. To the great disappointment of the two old friends, however, there was no reaction whatsoever. Apparently no one could see the crop circles except the workers in the fields who don’t seem to have been overly impressed by them. This went on for two years until the two old hoaxers realised that they needed a more publicly visible location. They found it in 1981 at Cheesefoot head, a hill in Hampshire where, because of the sloping ground, a crop circle would be highly visible to the public. When Spring came, they struck. The reaction was immediate. The very next day an article appeared in the local newspaper speculating about aliens landing in the fields. Reporters soon swarmed over the area and the story was reported nationwide. This was the beginning of the crop circle phenomenon. Over the years Doug and Dave continued to churn out the circles and, gradually, a whole industry of experts began to develop around it. People would write books about crop circles, deliver lectures on crop circles, and pontificate in every form of media known to man about what they believed lay behind the phenomenon. This was all to the great amusement of Doug and Dave. They collected all of the crop circle reports from the press and had a good laugh about them over their pints of beer. They also took great pleasure in discomfiting the so-called experts. When one expert announced that miniature tornadoes were what lay behind it because the crop circles always had a clockwise orientation, Doug and Dave went out the next week and made one in an anti-clockwise direction. They also started to branch out from the simple circular shapes and do more complex designs. During the crop circle flap, one expert solemnly observed how strange it was that the crop circles only ever appeared on Saturday mornings. This, of course, was because Friday night was pub night for Doug and Dave and they’d go out and make their crop circles after knocking back a few beers. One year, Doug’s wife became suspicious at the number of miles their car was racking up. She wondered whether he might be having an affair. Faced with these accusations, he had to come clean. He brought his wife in on the secret. She took it in good humour and after that, Doug didn’t have to hide it any more so he could make crop circles on any day of the week, not just pub night. The phenomenon became huge. Best-selling books were written about it. The queen was even reported to have one of them on her summer reading list. Eventually, there was talk of the government commissioning some kind of inquiry into the whole thing. That was it for Doug and Dave. They’d had their laugh but enough was enough. They didn’t want to see a whole load of taxpayer’s money wasted doling out millions to the so-called crop circle experts for a study that was going to be nothing but nonsense. So they confessed. They went public with radio and television interviews and did an exclusive in the Today newspaper for which they were paid £10,000. They even demonstrated how they made the crop circles with a plank of wood. At that time, Doug was 67 and Dave was 62. The crop circle industry proved surprisingly resilient in the face of these confessions. One researcher, Pat Delgado, who had co-written a book on the subject, gave up in disgust. Most of the others, however, kept soldiering on, claiming that Doug and Dave couldn’t have been responsible for all of the crop circles that had appeared worldwide. The two old gents, of course, had never made that claim, but they believed their efforts had inspired imitators elsewhere. The “experts” claimed that, while some of the crop circles were undoubtedly hoaxes, at least some were genuine. Some even advanced the claim that the Doug and Dave story might have been part of a deliberate disinformation campaign being orchestrated by MI5 to conceal the reality of the British government’s contact with the aliens. Controversy about crop circles continues. Even today, more than fifteen years after Doug and Dave confessed to hoaxing the whole thing, some continue to believe that crop circles have a mystical significance and a possibly extra-terrestrial origin. Brilliant, I never knew about the crop circle hoax, although I have heard alot about crop circles in general. I use to live on a farm in Yorkshire, one morning we looked out from our upstairs window and saw a crop circle in one of our fields. It was very complex and I did think it may have been ET but now I wonder if it was Doug and Dave on the way home from the pub? ?